How to Think Ahead in Poker? Poker is a game that rewards forethought and planning ahead. The best decisions take into account not only the current round of betting but also the cards that could come on future streets and the actions that each player could take later in the hand. Suppose you’re in a heads-up situation on the flop or turn where you’re the aggressor. These are the types of situations where a little bit of planning can go a long way because you’re completely dictating the course of the hand. To give you an example, suppose you’re just in a simple continuation betting situation. If you make your bet, you have to take into consideration the way the board could come out in different ways as well as the different lines your opponent could take. In short, there’s a lot to consider. Always consider what you’re going to do if your opponent raises. If you always take into consideration what you will do if your opponent raises, then your bets will instantly become much more effective, and your play will instantly net you better results. You probably don’t think about it in exactly this manner, but the way you choose which hands to play pre-flop actually has a lot to do with the planning I have in mind. Most of the times when you enter a pot pre-flop, you probably don’t have a very specific plan for what you will do on the flop, turn, and river. How could you? There are simply too many possibilities to plan for them all. At best, you might have a vague idea that if you raise Ace-King from first position, then you will bet most flops that connect with your hand as well as select flops that do not. Or if you call a raise with a suited connector on the button, you are probably thinking that you can take the pot away post-flop even on certain boards that do not connect very well with your hand. This is the sort of planning I have in mind, though most players don’t take it further than pre-flop. When you use reasoning like the above, you are not really making a plan for your specific hand. Rather, you are thinking about the situations you will be in and the things you will want to do after the flop and choosing which cards to play before the flop to best facilitate your post-flop maneuvering. When you and your opponents have larger stacks relative to the blinds, you can expect to encounter different post-flop situations, and consequently your pre-flop hand selection needs to change. In an aggressive game, one good pair is often enough to play for 100 BBs. Thus, players value pre-flop hands like big pocket pairs and Aces with strong kickers that will often flop one strong pair. Although the best of these hands (KK, AA, AK) remain very strong as stacks get deeper, smaller pairs like JJ and QQ and weaker off-suit Aces like AQo and AJo decline in value. This is because flopping a weak overpair or top pair with a second- or third-best kicker is no longer such a desirable result. When stacks are 200-300 BBs deep, you usually need more than one pair to play a big pot. Three-of-a-kind, straights, and flushes are the hands that tend to win pots of this size, and consequently you need to tailor your pre-flop strategy to favor cards that have the potential to make hands of this strength. That means that suited Aces with a small kicker are sometimes more valuable than off-suit Aces with a stronger kicker. It also means that, rather than re-raising with a pair like Jacks, it is sometimes preferable to keep the pot smaller pre-flop and try to flop three-of-a-kind. You are playing a $200 stack in a $.50/$1 no-limit hold ‘em game. The action folds around to an extremely aggressive player on the button, who has you covered and raises to $3. The small blind folds, and you sigh as you peer down at the cards you’ve been dealt in the big blind, already uncomfortable about the idea of playing out of position against this guy. One of the best means of combating players who raise aggressively pre-flop is to re-raise, or three-bet, them. Since they are raising a wide range, you can three-bet more hands for value than you would against more passive pre-flop raisers. In addition to obvious hands like AK and big pairs, you should expand your value three-betting range to include AQ, AJ, medium pairs, and sometimes even weaker hands like KQ, KJ, and AT. Against most aggressive pre-flop raisers, you’ll also sometimes want to three-bet weaker hands as a sort of pre-flop semi-bluff. Suppose you have decided that if this particular opponent raises your big blind, you will re-raise ATs+, AQo+, and 99+ for value. These hands are strong enough to be ahead not only of his opening range but of his range for calling your three-bet. Presumably, this aggressive opponent is raising so many hands that he will have to fold quite often to your three-bets. Thus, you decide that you can re-raise an additional 8% of your hands that will not be ahead of his calling range but that will play well enough post-flop to show a profit in combination with the fold equity they have pre-flop. In other words, you will re-raise some weaker hands in hopes of either winning the pot pre-flop, flopping a good hand post-flop, or successfully following up on your bluff post-flop. Again, it is hard to formulate a specific plan for when and how you will bluff after the flop. That does not make your choice of which 8% of hands to three-bet an arbitrary one, though. On the contrary, a fair bit of the value in this play comes from the times that you either flop strong or successfully bluff at the pot post-flop. Thus, you want to choose hands that will serve these purposes well. What it means to flop strong is primarily a function of stack sizes, so your range for 3-betting light should change based on how deep you and your opponent are. Any top pair is usually enough to get 100 BBs in against an aggressive opponent in a three-bet pot, so hands like KT and QJ are good candidates for light three-bets when you are not too deep. This is particularly true if your opponent will usually four-bet hands like AK and AQ that dominate you, as you will be less likely to flop top pair with a worse kicker. With deeper stacks, top pair and a marginal kicker is not such a desirable hand, and these high-card hands are no longer such good candidates for a light 3-bet. Small pairs become better candidates when you are 200+ BBs deep, as there will still be a lot of money behind the times that you flop a set. 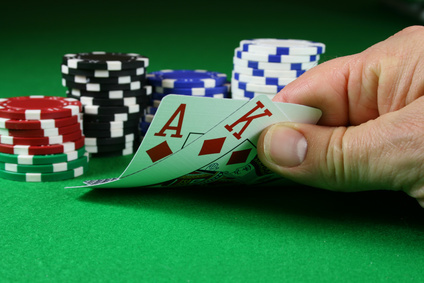 When you three-bet light, you will also want to bluff a lot of flops that do not give you top pair or a set. For this purpose, it pays to have a hand that will have outs against your opponent’s flop calling range. Suited and connected cards can flop flush and straight draws that will make your post-flop bluffs more profitable. This becomes particularly important when stacks are deeper and you may find yourself firing multiple barrels. Bluffing 200 BBs with a flush draw is a hell of a lot more desirable than doing it with undercards to the overpair your opponent is calling you down with. The key here is that even when you don’t have enough information to plan ahead, you can still think ahead. Knowing the situations you will likely end up in later can help you decide which hands to play now. This is logic that many players will understand from their pre-flop decision-making, but it’s important to recognize how it can be extended to later streets as well. How do you Bet for Protection?